Tegolin’s Tales is a Galway Theatre Company based in Connemara in the west of Ireland. It is owned, managed and brought to you by Tegolin Knowland and Seán Coyne. Tegolin’s unique style of story telling features specially designed masks that bring the characters to life. After each show Tegolin invites the children to join her on stage for ‘hands-on time’ with the various masks and props, and to have fun with the different special effects that feature in her shows. The company travels throughout Ireland and England bringing live theatre to festivals, schools and even children’s parties. You can also catch Tegolin during July and August in the Teach Cheol Renvyle and the celebrated Irish Nights at Paddy Coyne’s Pub Tullycross. Tegolin's Tales as featured on RTE current affairs program Nationwide. Suitable for children aged 4 to 12 years with an interest in all aspects of theatre and stage. Prepare to be brought on a memorable journey, meeting and exploring colourful characters along the way through Drama, Song, Dance and a whole lot more. The children participate in a fun-filled interactive non-pressurised workshop where their imagination is encouraged and nourished through the creative world of theatre. The workshops include Theatre Games and Exercises, Improvisation, Role Play, Creating Characters, Mime & Rhyme, Acting Skills and Musical Instuments from around the world, but most importantly having lots of fun and much much more. Tegolin Knowland is a professional actress and drama teacher with more than 20 years extensive experience giving drama workshops to children throughout Ireland and England. She has recently returned from Oxford where she was the Drama Facilitator with the Oxford Concert Party working on outreach community projects. 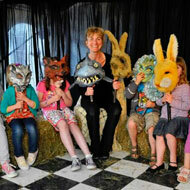 She has worked with children in schools, theatres, community groups, libraries and many different arts organisations. She has also written, produced and directed many theatrical shows for children using various themes such as 'the sea', 'the rainforest', 'fire', 'water', 'earth celebrations' and 'children from around the world'. Tegolin implements a comprehensive Child Protection Policy in line with national best practice.